This post was originally written on 1/14/14. I’m sorry for the delay in posting. Well, I’m sitting in Lviv airport, preparing to leave from what has been a life-changing trip. Things got busy once the Permaculture Teachers Course started, so I’ll try to summarize my experience here. The course took place in Truskavets, a small touristic village about an hour and a half from Lviv in the foothills of the Carpathian mountains. The village is famous for its mineral waters and hot springs Naftusia, Maria and Sofia. 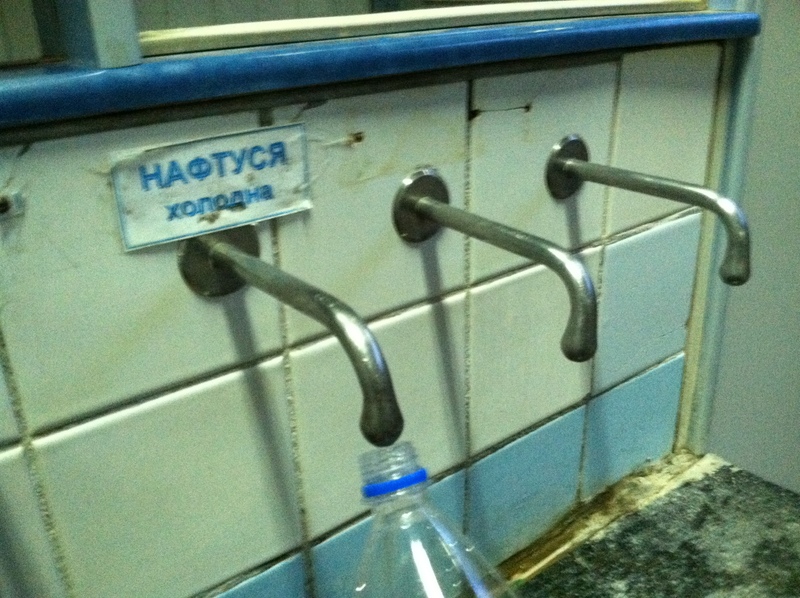 The water from each of these springs has different healing qualities (and different, distinct flavors). Research has shown that drinking small amounts of this water daily helps people regulate diabetes, and people claim that drinking it reduces signs of aging and has even brought cancer into remission. Apparently, the water contains strains of healthy bacteria that are unique in the world, and cannot last for more than an hour outside of its natural environment. Every other day or so, a small group of us would go to the springs to drink the sacred water. The course was very intensive, which unfortunately meant that I had very little time to explore. 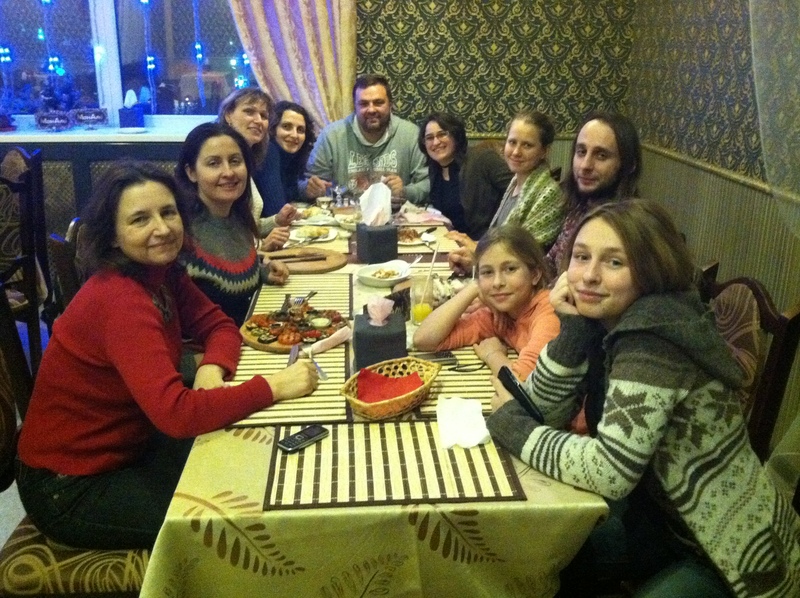 However, the connections I made with the permaculturists and environmental justice activists in Ukraine were incredible. My Ukrainian improved dramatically after only 2 days of being there. My master’s degree was in applied linguistics/TESOL, so the experience of learning academic content in a trilingual environment was particularly fascinating. The course focused a lot on pedagogy rather than permaculture, so it was a review of a lot the kinds of strategies I learned in graduate school. However, it was great to have the refresher and to develop the vocabulary to discuss Bloom’s taxonomy, differentiated instruction, as well as permaculture content in both Ukrainian and Russian. The course culminated in students giving 30 minute lessons about topics in permaculture. As a second language instructor, it was a terrific challenge to teach students how to create a seed bank in Ukrainian, with activity guides scaffolded in Russian and English. I’m glad I have a video of how I taught a class trilingually to add to my ESL CV. They also really enjoyed my presentation regarding how to apply permaculture principles to curriculum development in an urban context, and I actually wound up acting as as couch for many of them as they developed their own lessons. The final student lessons ranged from the practical to the theoretical. Galyna, a physical education instructor and nutritionist, taught an excellent lesson about the “Web of Life.” Oksana, a woman with her own piece of land in Novo Volensk, demonstrated how to create a pond and rainwater collection systems from her own experience. 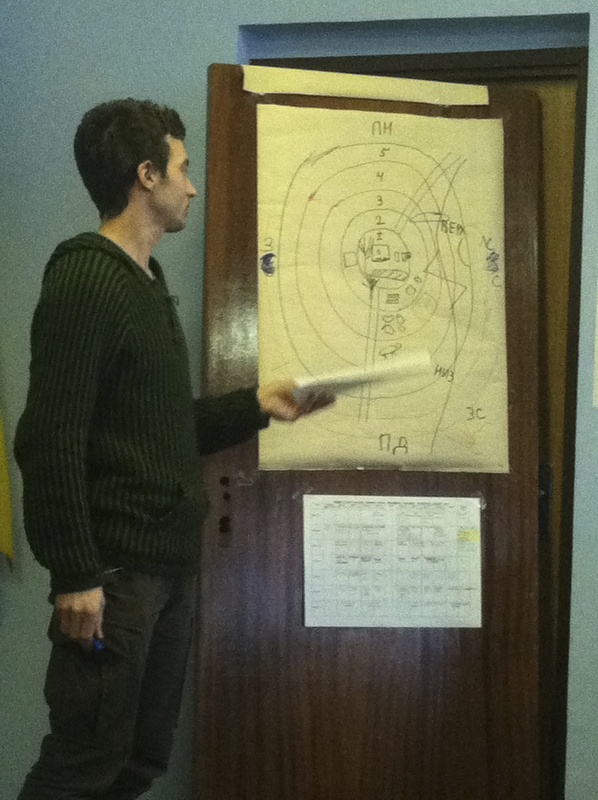 Pavlo and Bohdan taught the basics of permaculture, discussing how to zone a site, how to stack functions, and how to capture and store solar, water, and financial energy. Sasha presented about urban permaculture and waste reduction. Vita presented an innovative application of permaculture principles as it relates to the self, or what I’d like to call “Zone 000.” Tania presented a vision session, and Ilya facilitated a discussion about permaculture as it applies to intentional communities and ecovillages. Last night, I had an amazing send-off. I’ve discovered that I am a living, breathing Alan Lomax recording of traditional Ukrainian songs. I speak an “heirloom variety” of Ukrainian, a version which was brought over to the states and preserved before the influence of the Soviet Union. Last night, we celebrated Malanka, or Ukrainian New Year. Just like the diaspora in the US, the Ukrainians put a bunch of candles in the middle of the conference room to make a vohnyk (“campfire”) and we sang songs together long into the night. They were fascinated with the songs I sang for them– many of the songs that my family preserved have been lost, and they made recordings of the songs. 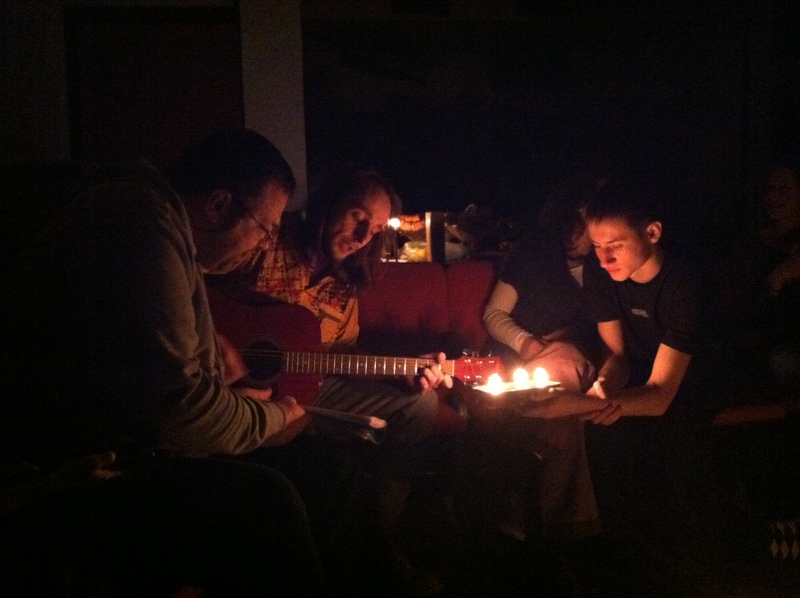 They also taught me new songs, which I recorded on my iphone to rehearse when I return. There were many songs that we all knew, and as I heard them singing “Rushnychok” “Chervona Ruta” “Chom ty ne prejshov” and other classics, I was brought to tears. My family is not so weird, after all. I am not alone. I am part of a continuum, a rich history and culture that is recreating itself throughout the world. The essence of Ukrainian culture that my grandparents and parents passed down to me is not a myth. It is, in fact, very real and very beautiful. The fact that I carry with me the seeds of something that real Ukrainians value and want to learn from also makes me feel like all of those years of Saturday school and Ukrainian scouts had a greater purpose for preserving our heritage. For this, I am incredibly grateful. My hope is that my new Ukrainian friends will come visit me at Crow Forest Farm once I’ve begun teaching courses from there, or at least meet with my family in New York someday. The NGO Permaculture in Ukraine plans to run a regular PDC (Permaculture Design Course) this summer. If the timing is right, I hope I can attend so I can learn more Permaculture content in Ukrainian and Russian. As far as PDCs go, Eastern Europe is the new frontier. 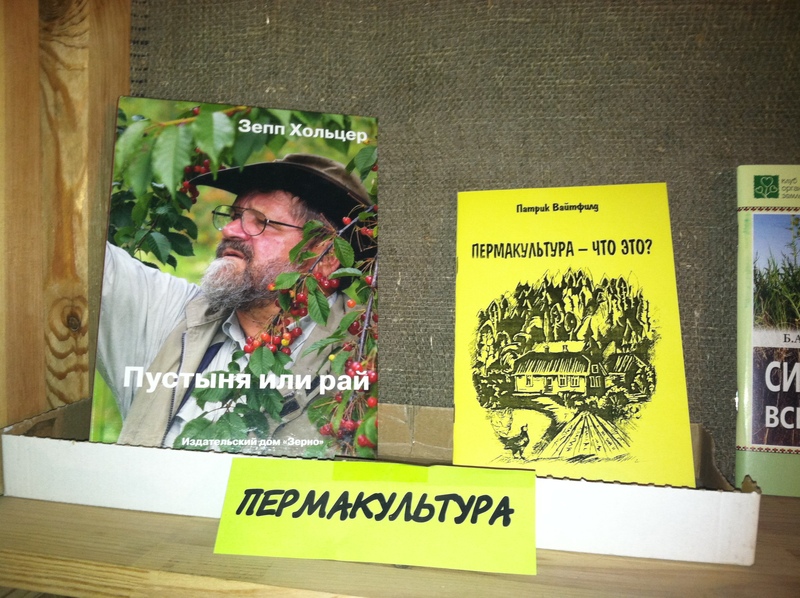 I will write more about my interviews with the organizer os NGO- Permaculture in Ukraine in a later post. They and their work are fascinating, and I look forward to meeting again in the future. I am grateful to the people I have met here, and can’t wait until our next collaboration. 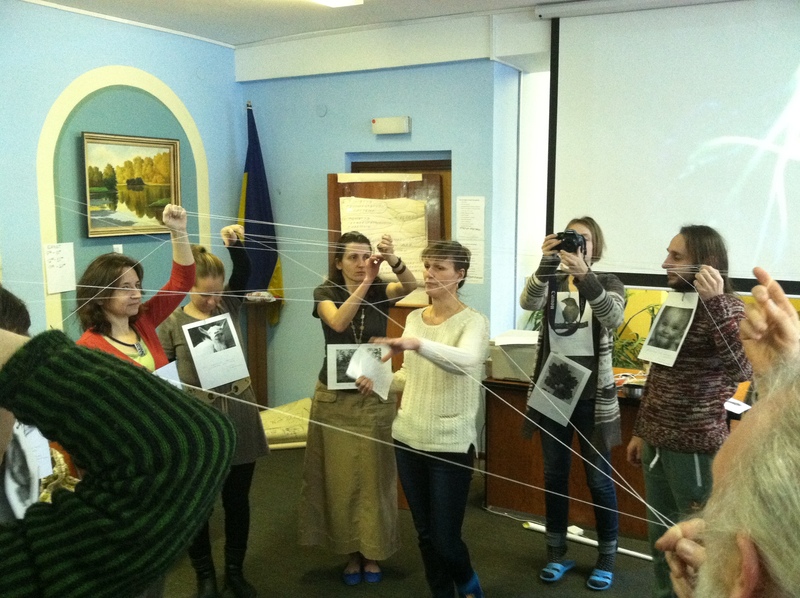 ← Permaculture in Ukraine Day 3: What is Permaculture? awesome story, the travel to find someone’s inner self and reborn. looking forward to next story.